Growth hacker Sean Ellis has one clear advice to companies that want to grow: Test more! Experiment! And test again! Sean Ellis was the keynote speaker at the start-up conference The Shift in Oslo. But before that he had a full-day workshop with a number of Schibsted companies to teach them growth hacking. 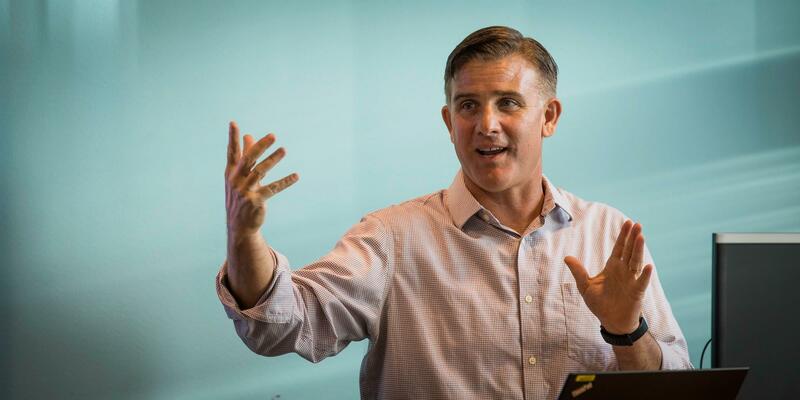 Sean Ellis is the father of the concept “growth hacking”, an agile approach to speed up growth in companies. He is well known for having helped companies like Dropbox and Eventbrite achieve exponential growth. Ellis is also the co-author of “Hacking Growth. How Today’s Fastest-Growing Companies Drive Breakout Success”. “Growth hacking has been instrumental in building successful venture companies internationally. We believe that the growth hack mentality can be key for innovation within mature companies as well – and therefore are happy to bring both growth companies and legacy business together for this workshop, “ says Christian Horn Hanssen, investment manager in Schibsted Growth. Most important: Experiment and test! The number one tip to companies that want to grow? “Experiment! And test! And experiment again! And test!, “ says Sean Ellis. Because one of the differentiators in business today is to have a growth mindset. And an essential part of that, Ellis explains, is to always think there is a better way to do things. Therefore companies must make lots of experiments and tests. “When we ask companies to quantify how much testing they do, most are not able to do so. So just by start testing hypotheses, improvements will come along,” he says. Find your North Star Metric! Almost as important is to find the one metric that measures the value you are giving your customers. Sean Ellis calls this the North Star Metric – which will guide your navigation in growing your business. The North Star Metric should be a shared mission for all the teams in the company. But it must focus on the true value customers actually receive. For many companies this is a new way of thinking. For instance, Sean Ellis points out, it is very common to only measure the number of new customers or different financial metrics. “But new customers will not grow the business if you cannot retain them, “ Ellis points out. Instead the metric needs to capture what truly keeps customers coming back again and again. Sean Ellis uses Facebook and its CEO Mark Zuckerberg as an example of a company that has taken growth hacking to its heart. The North Star Metric driving Facebook is Daily Active Users. Therefore Zuckerberg repeats and repeat this metric in his communication, as it is the best to measure that users actually get value from using the social network. And what does it take for a new Facebook user to experience value? They must find friends and start receiving updates from them. And it must happen quite fast – or they will lose interest. Following the metric of Daily Active Users, Facebook has found that a new must see updates from at least 10 friends during the first 7 days to experience value. If it is less, users will tend to leave the service, according to Ellis. “Zuckerberg has done an amazing job. I realized recently how he brings Daily Active Users into almost any conversation he has. It becomes the mission that drives the business,” says Ellis. Similar examples from other well-known companies: Airbnb´s North Star Metric is number of nights booked – a metric that captures value to both hosts and guests. Uber uses number of rides as their similar metric. During the workshop, the Schibsted companies worked on how they could climb up the so-called growth pyramid, developing new skills in the organization. Defining a North Star Metric is one step. On the next ladder is forming a growth team with cross-functional experts such as marketers, engineers, designers and data analysts. On the top level in the growth pyramid, the whole company has a growth mindset and culture, says Sean Ellis. But at the core of growth hacking is running experiments. The more experiments, the better, Sean Ellis explained to the Schibsted experts at the workshop. The experiments should be designed to push forward the North Star Metric. So build a shared mission!, was his advice on the workshop. And then work together from there!